Built with experience gained from a variety of battlefields, Russian helicopters have evolved into extremely survivable fighting machines, which explains their enduring popularity in India, Pakistan and Afghanistan. After bagging a mega order to supply at least 200 Ka-226 utility helicopters for the Indian Army and Indian Air Force, Russia has again scored a coup by landing a $1.1 billion deal for 48 Russian-made Mi-17 multirole choppers. The deal is likely to deepen India’s connection to the Russian armaments industry. Over the past five years, the IAF has received 121 Mi-17 V5 helicopters, and has over 300 Russian Mi-8 and Mi-17 helicopters in service. India also has two squadrons (20 units) of the Mi-25 Hind, the world’s only assault helicopter. Across the border, Pakistan has a similar wish list of Russian weapons. 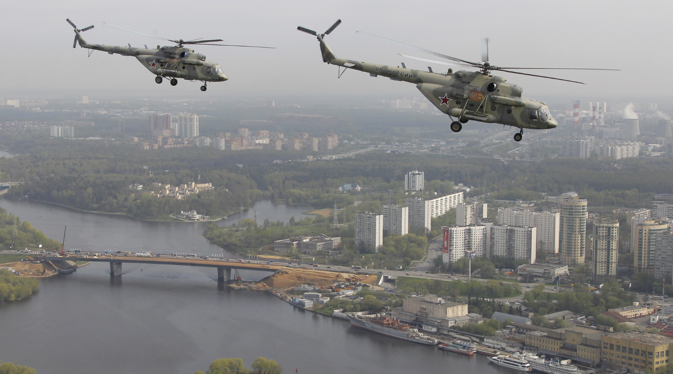 On June 2, 2014 Sergey Chemezov, the CEO of the Russian state-run technologies corporation Rostec, said Moscow was lifting its – undeclared – arms embargo against Pakistan and was negotiating the delivery of Mi-25 helicopter gunships to the country. It was hardly a landmark deal. Between 1996 and 2010 Russia had sold 70 Mi-17 transport helicopters to Pakistan. Currently, the Pakistani military operates 100 units of this large helicopter. In Afghanistan, the Mi series helicopters are the favourite flying platforms. The Afghans have both the Mi-25 as well as the Mi-17. So what explains the popularity of these Russian flying machines? Russian choppers are not only simpler to fly and cheaper to operate, they are more likely to bring their crew home alive after a battle. Learning from their experiences during the Afghan war of the 1980s, the Russians have vastly ramped up the survivability of their choppers. The proven effectiveness of Russian helicopters is precisely the reason why the US Defence Department – no less – paid Moscow $1 billion for supplying the Afghan military with Russian-made helicopters. The Pentagon’s decision to equip the Afghan army with Russian helicopters instead of American ones was based on sound military logic – you fight with the best weapons you can. And in Afghanistan’s harsh and hostile environment, Russian choppers are more likely to come out unscathed after a Taliban rocket attack. The Pentagon war planners would have easily awarded the contract to Bell or Sikorsky if the American manufacturers had a chopper that could survive in Afghanistan. The Mi-17 is being used by the IAF at altitudes considered impossible by its Russian designers. As well as high altitude capabilities, the Mi-17 can carry 26 troops and has extra armour plating that ensures survivability. Modified – no pun intended – versions of the Mi-17 V5 ferry India’s Prime Minister and President. America’s setbacks in the Middle East and its pivot to the Asia-Pacific have created several low-hanging opportunities for Russia in the region. Pakistan is one of them. In fact, for the first time ever Russian and Pakistani interests have converged – in the backdrop of a resurgent Taliban. America’s slow motion exit from Afghanistan has got the jehadis salivating at the prospect of regaining power in the war-torn country. While the Taliban may not have won more than a handful of battles in America’s longest war, in the popular Afghan narrative they have defeated yet another superpower. If, and when, they storm the gates of Kabul, the Islamists are likely to target Pakistan next. This has set off the alarm bells in Moscow. The Russians are paranoid about Islamists targeting their soft underbelly in Central Asia. The Pakistanis are worried too. Islamabad feels it is being abandoned in the midst of its do or die struggle with the Islamists. Although it is a fact that they – in cahoots with the US, UK, China and Saudi Arabia – uncorked the Islamist genie in the first place, it is also true Pakistanis are currently bigger victims of terror than India. For instance, in a joint attack in 2011 the Pakistani Taliban and Al-Qaeda destroyed the Karachi Naval Base. So, like it or not, Islamabad is really at the frontlines in the battle against the Taliban. The Pakistanis are, therefore, looking at extricating themselves from the US-created mess. The Russian gambit neatly dovetails into Pakistan’s requirement. Moscow has already entered into a deal with India where New Delhi pays for Russian weapons to the Afghan military. The arms deal with Pakistan completes this pincer move against the Taliban. Russian assault helicopters can be the game changer in battles with guerrillas up in the mountains. In Afghanistan, where paved airfields are rare, helicopters are the only way to get out and about. By supplying these gunships to Islamabad, the Russians get the Pakistanis to continue with the job of clearing up Islamist opposition. The Mi-25 is known as the world's only assault helicopter, for its combination of firepower, troop-carrying capability and speed. Its official speed record set over a closed 1000 km course of 332.65 km/h still stands after 40 years. The Mi-25’s fuselage is so heavily armoured that it can resist impacts from 12.7 mm rounds from all angles. Its cockpit is protected by ballistic-resistant windscreens and a titanium-armoured tub. During the Soviet occupation of Afghanistan in the 1980s, Russian pilots nicknamed the Mi-25 the “Flying Tank” because it was not only extremely survivable, it also created terror among the Afghan mujahideen. The gunship was so effective the fear-stricken Islamic fighters called it the "Shaitan-Arba" or Satan's Chariot. Moscow and New Delhi have a strategic defence relationship and Russia isn’t going to risk that over a pea-sized helicopter deal. Boris Volkhonsky, head of the Asian sector of the Russian Institute for Strategic Studies, feels that although India has always tended to react badly to the idea of arms being supplied to Pakistan, he doesn't expect collaboration between Moscow and Islamabad to cause problems. “India and Pakistan both buy weapons from the US, and this has not bothered (India),” he says.